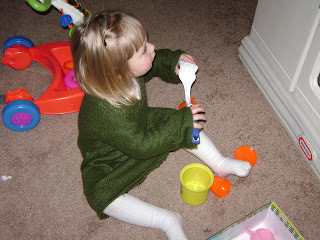 Thrillingly Thrifty: Homemade Christmas - Recap! Maddy, in her Christmas dress. She was not wanting to be photographed, so this is the best I got. It's made from a Women's Sweater, found at Value Village. And I made a hat that she refused to wear, go figure. 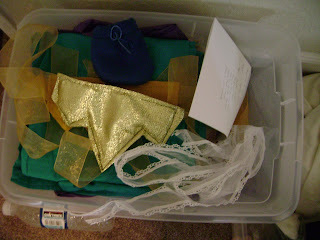 Nativity Dress-Up kit. I got all my fabric from Mom's Fabric Closet for a very good price! (Free! Thanks Mom!) 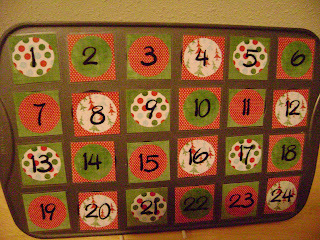 We used it on Christmas Eve then I wrapped it up and gave it to Kyle's sister's family as part of the gift exchange. I wish I'd had the energy to make a kit for us too! 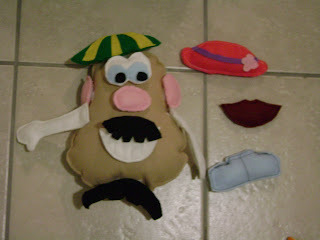 Felt Mr Potato Head. I saw this idea on Make It and Love It and I did indeed LOVE IT! So did a lot of the crafting blogs out there, from what I gather...I've seen a lot of other versions out there that are MUCH better than mine. But then again, I did have two screaming kids and one cranky husband around while I was trying to desperately finish this on Christmas Eve-Eve. I'm loving it even more because Maddy is suddenly loving playing with it...she's really into body parts right now. 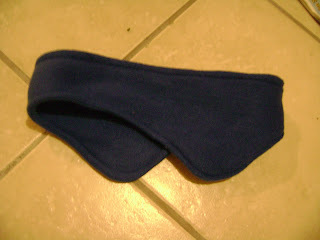 A lame-o ear-warmer thing for my brother-in-law. I couldnt think of anything else to make him! I used a pattern, some old one my mom had, and I had plans to make a matching fleece sweater thing for their dog Bolt, but it just didnt happen. A Black Apple Doll. I LOVE these dolls, so cute! I wish I could say it was easy, but I didnt think it was. This was my 3rd doll and it still has some issues that just arent very visible. I did like being able to use up scraps from one of the aprons I made this past year - this was my FAVORITE reversible apron fabric, which is sad because it was my first adult sized apron so it was not nearly as nicely made as my later ones. And when I bought the fabric it was on clearance for $2/yard at Craft Warehouse, I think it must have been discontinued because I havent been able to find it again (but then again, I dont usually go to Craft Warehouse for fabric). 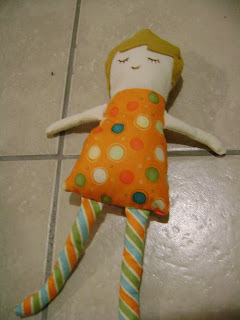 Anyways, if you want to try your hand at this doll, here's the link. Not sure what you call these things. 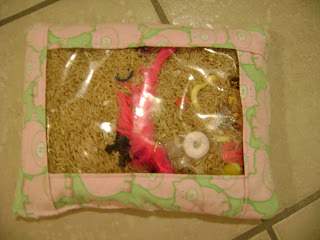 A Bag of Junky Little Things and Like a Pound of Rice. My MIL had made one for Maddy the Christmas before she was born, and she hardly even touched it until John started showing a lot of interest in it, so I decided I needed to make a second one so they could each have one. 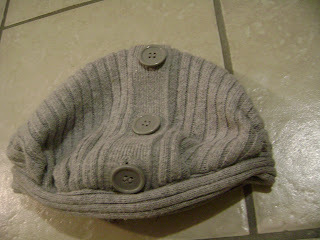 Another sweater hat for Maddy - still unfinished. 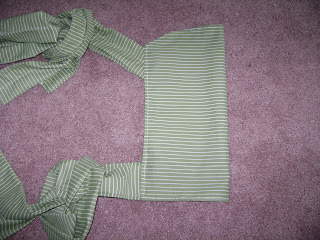 Needs embellishments, like black ribbon, and some elastic but I dont know when I'll get around to it. 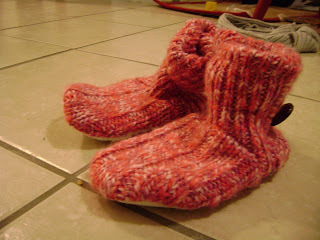 Slippers for Maddy, made out of a Value Village sweater. 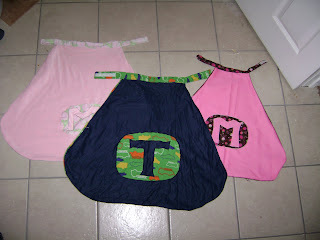 I made it completely from scratch, no pattern involved, which is why they dont stay on very well. 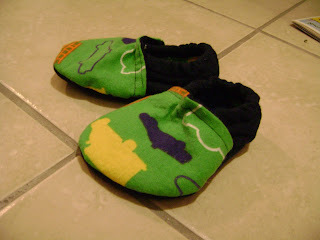 I need to put some more/tighter elastic in them, but I think I may have to hand sew for that so I keep putting it off. 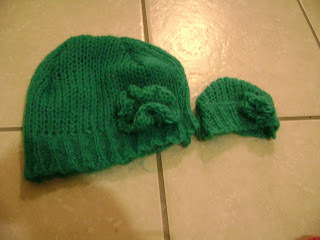 A beanie for my sister Hannah, with a matching one for Julie (her American Girl doll). 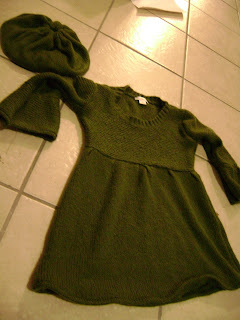 These are made out of a Mohair sweater I got at Value Village for cheap - it was actually a cute sweater. I wore it to our Relief Society Christmas Dinner, obviously before I cut it up. I also have a beanie I made for myself out of it, but I'll post pics of that seperate since it wasnt a Christmas present. 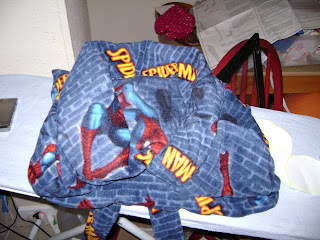 Kyle's AMAZING Spiderman Robe - the picture does not do it justice!!!! The pattern had RIDICULOUSLY stupid instructions, but I mostly figured it out and the best part I did it all while Kyle was off studying so he really had NO CLUE he was getting it. He wears it almost every night, which just tickles me pink! I wish I could say more about how these turned out but its a sensitive subject still. I got kinda burned out after all these crafts in so little time, so I've done a whole lot of nothing these last 3 weeks. There's a couple crafts I've started, gifts and stuff that I really need to get done, but I havent the motivation really. Being pregnant will do that to ya. 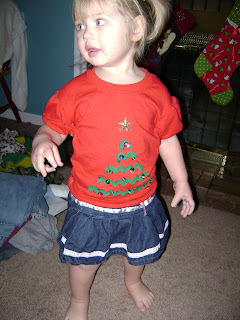 I did get something done today, but there's some really cute pics of Maddy in it so I'm gonna post it on my other blog. 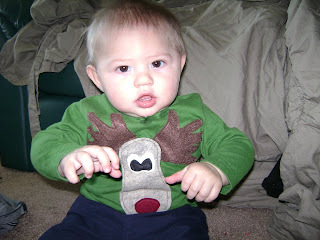 I figure anyone that reads this blog reads the other one too, so I'd rather show it off there. Once again - WOW! All that stuff is awesome!